Infusing heritage with exceptional craftsmanship and a sense of modernity is Arita Porcelain Lab, the contemporary name of the Yazaemon Kiln, which was founded way back in 1804. Arita Porcelain Lab is now Japan’s leading producer of the acclaimed Imari porcelain, or Aritayaki as it is known in Japan. The Lab’s exquisite handmade designs effortlessly bridge the gap between art and functionality, tradition and innovation. Read on to discover this fascinating craft laboratory— and don’t forget to let us know your thoughts in the comments below! If you find these ceramics as irresistible as we do, you can also purchase them online at Alexcious. The first Japanese porcelain, Aritayaki, originated in the town of Arita, on the southern island of Kyushu in the 16th century. Even though the country’s links with the outside world were severely limited, these particular ceramics were in great demand internationally. They were exported world-wide by the Dutch West India Company from the port of Imari - hence they became known outside Japan as Imari porcelain. The founder of Arita Porcelain Lab, Satoru Matsumoto, was the seventh generation head of the Yazaemon Kiln. When he took over the company, he found that the storied kiln was struggling to connect with modern users. His solution was to envisage a way traditional Japanese pottery could be blended with a contemporary lifestyle. We spoke to Matsumoto to understand how to achieve this delicate balance. The drive to modernize has not extended to automation however. Whether recreating a heritage piece, or a completely new design, each item of Arita pottery is still crafted, fired, and painted by hand, according to techniques that have been passed down through generations of skilled ceramicists. The contemporary colors and patterns can be seen in vessels such as these palm-sized plates, part of the Japan Snow Collection. Here, futuristic matte platinum is elegantly blended with iconic Japanese motifs. The striking paintings are chosen for their positive meanings in Japanese material culture: Kara-kusa (foliage scrolls representing new life), ocean waves (eternal beauty), young bamboo (flexibility), and a fishing net (eternity). These palm-sized plates are ideal dipping bowls for sauces or tapas-style starters. You can get your hands on this classic Japanese porcelain now at Alexcious. The strong emphasis on centuries-old craftsmanship with Japanese heritage is seen in this hand painted Arita plate, which features a foliage and flower illustration that date back to the Edo Period. Again, we see old and new mingle here, reflecting both the contemporary need for functionality, and the Japanese tradition of beautiful, ornate objects. To buy this Japanese ceramic plate online, check out Alexcious. If you're interested in the works of some other contemporary Japanese ceramic artists check out these 6 Innovators to Watch! 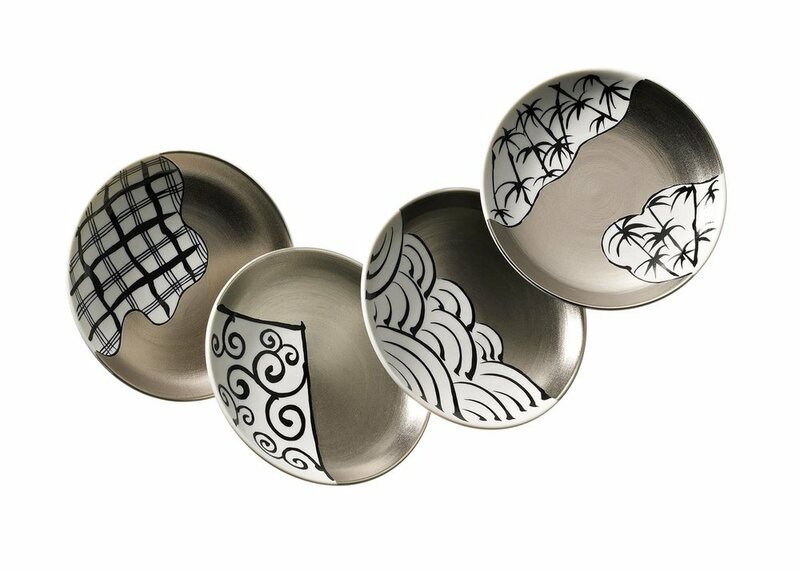 It’s important to Matsumoto that these designs are used daily, and become part of one’s lifestyle and home environment. ‘I want to present Japanese-style luxury not just in tableware, but also interiors and other aspects of a whole lifestyle,’ says Matsumoto. ‘The most important thing,’ says Matsumoto, ‘is to be able to pass on craft skills to the next generation.’ The design house relies on its talented craftspeople to not only maintain the historic skills that built that Japanese porcelain industry, but to continually develop new ideas and ways to add a little heritage into the modern home. The result? Beautiful, contemporary Japanese pottery that adds a little heritage into the home whilst being functional and durable too. We can’t wait to see what’s in store for Arita Porcelain Lab next! This article was written in cooperation with Alexcious. All product suggestions are independently selected and individually reviewed.